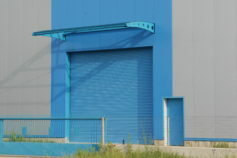 Industrial Sectional Doors | BIOROL S.A.
Sectional Overhead Door is an exceptional product made of polyurethane panels and able to operate for a long time without any problems. To make this happen BIOROL S.A. uses only the best materials in its construction and trusts the production procedure only in highly specialized personnel. The whole process is backed up by R&D and Quality Departments to ensure a result that fits your needs and will continue to operate for many years to come. This way you can be sure that your BIOROL S.A. Sectional Door will operate safely for a long time, with minimum annual maintenance and zero problems. Every BIOROL Sectional Door is designed to cover all your needs. High quality operations, great aesthetics, wide range of colors, are only a few of the characteristics that make it the right door for you. 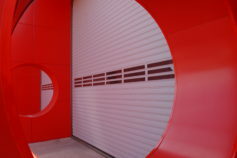 BIOROL Industrial Sectional Door is designed and manufactured with the higher quality standards and materials. Whatever the construction specifications, BIOROL Industrial Sectional Door will be designed and manufactured to fit the appearance of the building perfectly. 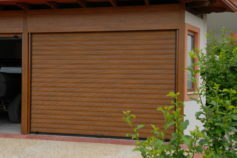 For us, there are no limits in garage door construction. You name it, we build it. 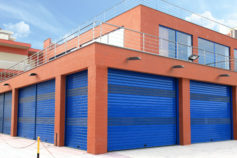 One of the important issues that worry a sectional door owner is security. 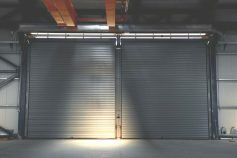 BIOROL Industrial Sectional Door is manufactured with from hot galvanized steel sheets thus making it really sturdy and keeping unwanted visitors away. Heat insulation of a Sectional door is an important selection factor. Panels and hence industrial Biorol doors allow transmission and minimal heat loss to the external environment ensuring maximum savings in energy consumption. It helps your building to keep warm in winter and cool in summer. In the corresponding technical brochure of our company you will find accurate measurements which will help you to precisely calculate the contribution of a BIOROL Industrial Sectional Door in your building. Tranquility is often an important factor for the success and efficiency in a workplace. This can be achieved by selecting a BIOROL Industrial Sectional Door, since it can provide considerable sound insulation. The sound reduction measurements and all performance factors have been tested and approved in laboratories and according to strict standards set by the relevant European directive. One of BIOROL’s main advantages is quick production and delivery of custom products (tailor made) even when we have to work on special construction or paints. With respect to the customer and his requirements, we can ensure that every door that comes out of our factory, will reach to him fast and fully operational. When your desire is for your door to have a uniform appearance in the internal side BIOROL has the perfect solution for you. Even though the guides and the accessories are not painted on the internal side, now you have the choice to have them painted with the same color (RAL 9002) as the internal side of the panels. 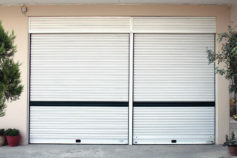 In special occasions a metal frame must be constructed so the door can fit on the building. When this is necessary, BIOROL makes sure to construct it in a way that its appearance is in concordance with the door. All you have to do is ask and we are here to make it happen. All BIOROL polyurethane panels are available in several different types of surfaces. Stucco Sandgrain and Smooth are the basic surfaces. By combining them with the different types of colors, we create a wide selection for you to choose for. A wide range of colors that can satisfy any customer’s requirement. Certified architectural powder coatings give exceptional durability. Ask only for original BIOROL panels.Powder coated panels in 26 standard matte hues and many more on demand, can cover every request and satisfy even the most demanding customers. The painting procedure is controlled entirely by BIOROL S.A. and this is why we can ensure the quality of every panel that comes out of our factory. High quality powder coating with corrosion resistant varnish ensures that the color of your door will last for many years. It is important for every sectional door to be stressed as little as possible, which means less uses everyday (open-close). 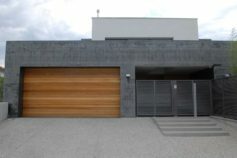 That is why we offer the choice of a Pedestrian Door that allows free people passage without opening the sectional door. It can be manufactured in a maximum width of 1200mm. It can also be produced with a low-threshold to allow free passage for wheeled loaders etc. It can also be equipped with various accessories like windows, locks, security bar and more. Like in every other product, BIOROL always makes sure that the pedestrian door (incorporated or not) will have a uniform appearance with the rest of the sectional door. Using specially designed profiles BIOROL manufactures glazed aluminum sectional doors. This way one can have access to the maximum amount of lighting a sectional door can provide. Single or double plexiglass can be used according to the customer’s needs. 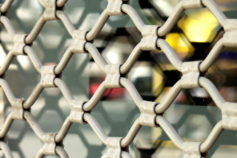 As a third option a metal grid can be placed on the panels when additional ventilation is the desired result. Aluminum panels can be combined with the polyurethane panels perfectly allowing you to make any combination that you desire. 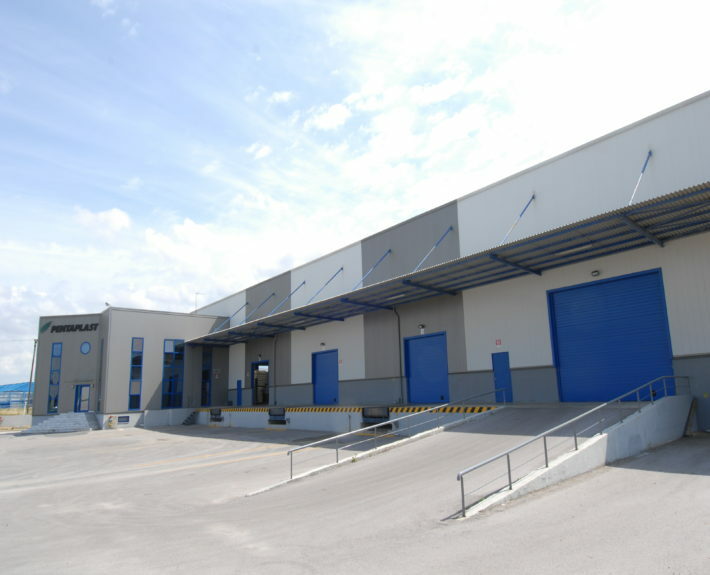 All the sectional doors manufactured by BIOROL are accompanied by the appropriate, reliable and long life tested motors and electronics that make every the use of the door an easy and safe matter. Cerca un portone accessibile ma di alta qualità per il suo prossimo progetto?